Combine dry ingredients in large mixing bowl and add oil and water. When it has risen, ‘punch’ the dough once to remove air bubbles. Remove from bowl and knead gently for 1 minute. Roll the dough out to desired size and add your favourite toppings. 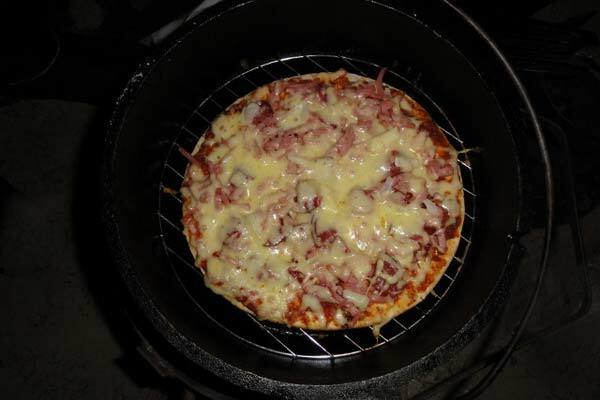 Cook in a hot camp oven with trivet. Use additional coals on the lid. These quantity will do two pizza bases that fit into a 12″ camp oven, if using the larger pizza pans use 2 1/2 cups flour. If you want a thin and crispy pizza base leave out the yeast. Have you tried this recipe? Share your thoughts with us below. Please feel free to rate & review this recipe.